Explanation: This gorgeous galaxy and comet portrait was recorded on April 5th in the skies over the Oriental Pyrenees near Figueres, Spain. From a site above 1,100 meters, astrophotographer Juan Carlos Casado used a guided time exposure, fast film, and a telephoto lens to capture the predicted conjunction of the bright Comet Ikeya-Zhang (right) and the Andromeda Galaxy (left). This stunning celestial scene would also have been a rewarding one for the influential 18th century comet hunter Charles Messier. While Messier scanned French skies for comets, he carefully cataloged positions of things which were fuzzy and comet-like in appearance but did not move against the background stars and so were definitely not comets. The Andromeda Galaxy, also known as M31, is the 31st object in his famous not-a-comet catalog. 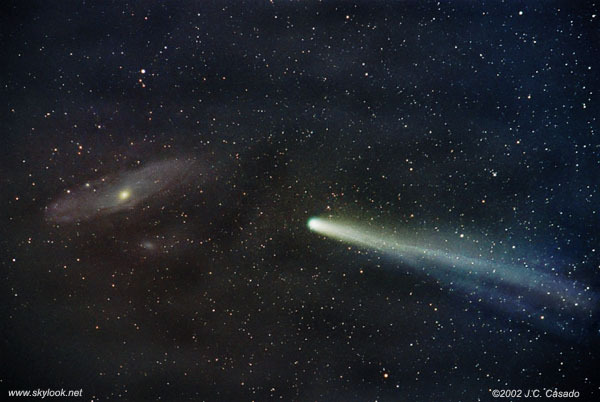 Not-a-comet object number 110, a late addition to Messier's catalog, is one of Andromeda's small satellite galaxies, and can be seen here just below M31. Our modern understanding holds that the Andromeda galaxy is a large spiral galaxy some 2 million light-years distant. The photogenic Comet Ikeya-Zhang, now a lovely sight in early morning skies, is about 80 million kilometers from planet Earth.